What does it take... to photograph an unforgettable sunrise? I know, I know... a really good alarm clock! Well, you actually need a little more than that. In the town of Talisay in Batangas, along the cold windy shores of Taal Lake, we awaited sunrise with a jacket and a prayer. This time two years ago, we made a spur-of-the moment trip to capture our last sunrise of the year. 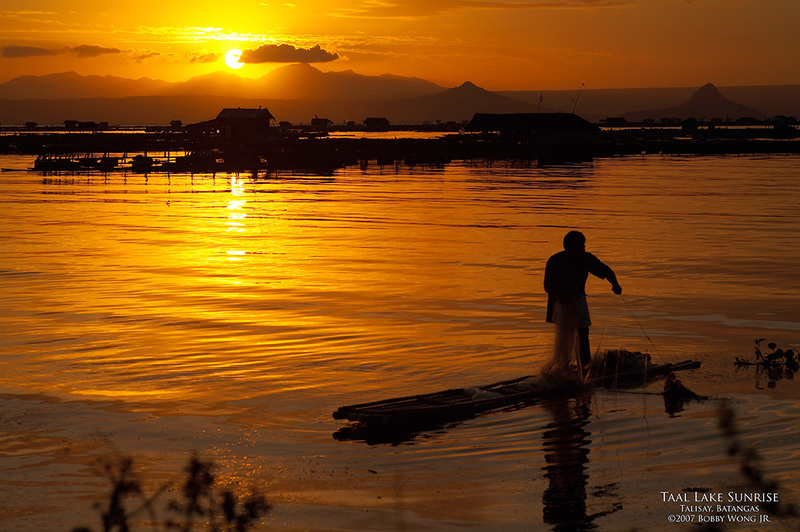 We had a classic image in our minds: fish pens and stilt houses silhouetted against the dawn sky. Simple enough. At about 2:30AM we drove two hours to the sunrise point, and in near-total-darkness, hauled our gear down a dirt path, winding through a field of waist-high grass. Standing by the edge of the lake, we identified true east, selected a workable vantage point, planted our tripods on the ground, and then compose our shots as silhouettes started to appear on the horizon. As the sky brightened, we swapped density filters and tweaked exposures, waiting for the exact moment when every element in our minds' image came together. Lucky as we often are, a lone fisherman was minding his nets nearby. This unplanned element would be part of our composition. About an hour or so later, we were done. So what does it take? To trade 4 hours of sleep for a handful of images, you NEED to really want to do this stuff! To witness the darkest part of the night become day... priceless. Try it! Enjoy. Exceptionally beautiful capture! You are an artist with a camera - I'll leave the hard work to you and selfishly enjoy the product of your labor of love. I like taking sunset photographs but yours are a sublime! If you haven't done a museum, try the National Museum. With my compliments. I do tours and people have enjoyed the architectural elements of the colonial era buildings. course I'll purchase a million! Any chance you'll let us use this for one of the inside pages of the Management Plan to be printed in December? Theplan is for the entire lake basin that is set to be approved on Thursday by the Protected Area Management Board. Please let me know if we can use it. Which barangay is this, by the way? Thanks. Hi noniedavid, photography can change how you see you world. Thanks bertN, Lianne, Pete, much appreciated. Hi JohnSilva, news of your excellent museum tours have spread far and wide, I regret missing the last one with SteveC, thanks for the invite and one day you will see me there. Hi Ipat, to protect Taal Lake? Yes of course, absolutely, feel free to rip. Hehe, no thank you. I am definitely not a morning person. I'll let you do it and enjoy your photos. I'd surely do that, cutting my sleeping hours for some priceless shots is worthy...then I can take a peaceful nap after capturing the precious moments. im a morning person and wouldnt miss this. this is a once in a lifetime experience. thanks for sharing. do you by any chance teach classes on taking photgraphs? sorry now this would depend on the location and the fee, of course....photography has Been one of my interest way before but couldnt due to financial reasons? ?